This video is with Indiana State Men’s Coach Greg Lansing. 5) Being Strong with the Basketball on the dribble. I like the idea of including the back dribble. I feel that is something that I have not included enough in our driving drills. The execution in the video is not great–these are not his players and are players doing their best to demonstrate a new drill at a coaching clinic. He also does not have anyone harassing them on their 7 second dribble. You can also include the types of dribble moves and finishes that your players use. This is a You Tube videos, so you will need to have permission to view You Tube videos. Make sure your sound is on as you watch. Click the play arrow to see the videos. If you are interested in learning more about the entire DVD that this sample came from, click this link: Individual and Team Skills and Drills . 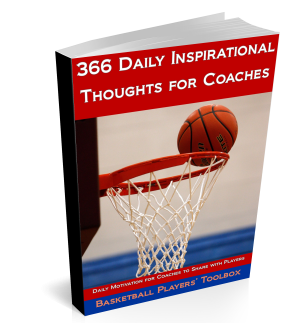 Anyone who purchases anything from the store receives one of my basketball coaching eBooks as a bonus. Just email me and let me know which one you would like to receive!